Ingredients: Filtered Aqua, Cocos nucifera (coconut) oil, Elaeis guineensis (palm) oil, Pinus banksiana (pine) extract, Matricaria chamomilla (chamomile) flower extract, Urtica dioca (nettle) leaf extract, Taraxacum officinale (dandelion) leaf extract, Trifolium pratense (clover) flower extract, Citrus Tangerina (Tangerine) Oil, Pyrus malus (green apple) extract, Ananas sativus (pineapple) extract, Olea europaea (olive) fruit oil, Linum Usitatissimum (Linseed) Seed Oil, Cucurbita pepo (pumpkin) seed oil, Helianthus Annuus (Sunflower) Seed Oil, Persea Gratissima (Avocado) Oil. Nice light scent, absorbs into the skin right away, no oil feeling on skin (can put clothes on right away). Awesome line of products! Super pleased with it! 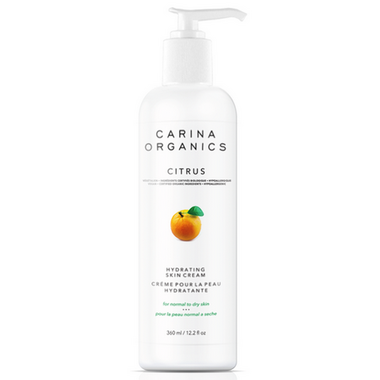 Carina products are one of the cleanest out there. This absorbs well, and the scent is not overpowering. Love it! The sent is nice, ingredients are natural, adds moisture.